Steve Bass is a native of Seattle. He graduated from Queen Anne High School in 1969 and from the University of Washington in 1973. He is a partner with the national accounting firm CliftonLarsonAllen LLP. His clients include many types of nonprofit organizations, including social welfare agencies, schools, foundations, and healthcare providers. Bass has served on many boards including the Presbytery of Seattle. 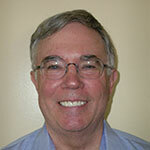 Currently he is a board member for the Presbyterian Church USA Foundation. He is the chairman of the audit and finance committee and is also a member of the executive committee. The Foundation manages assets of over $1.4 billion for its members and affiliates. Steve’s interest in African American history comes through his interest in nineteenth century American history. It all started in 1988 when he read James McPherson’s Pulitzer winning book Battle Cry of Freedom (1988). He has travelled extensively throughout the eastern part of the country, visiting many historical sites. He has collected many history books related to this period and has been a guest instructor for middle schoolers. He is concerned that the public schools have over the years diminished their emphasis on teaching the history of this formative time period. He believes that students are being deprived the opportunity to learn about their cultural heritage. That is why he is pleased to be a Board Member of BlackPast.org and is committed to its success.